Professors, Assistant/Associate Professors Recruitment 2017 in Telangana State Horticultural University, SKLTSHU Professors, Assistant/Associate Professors Recruitment 2017, Assistant Professors, Associate Professors and Professors/Teaching posts 2017 in Telangana State Horticultural University, Teaching posts/Assistant Professors, Associate Professors and Professors in SKLTSHU. 80 Teaching posts in Sri Konda Laxman Telangana State Horticultural University (SKLTSHU). Notification For Recruitment Of Technical Positions In The Cadres Of Assistant Professor, Associate Professor And Professor In Various Research Stations, Constituent Colleges And Polytechnics Of SKLTSHU. 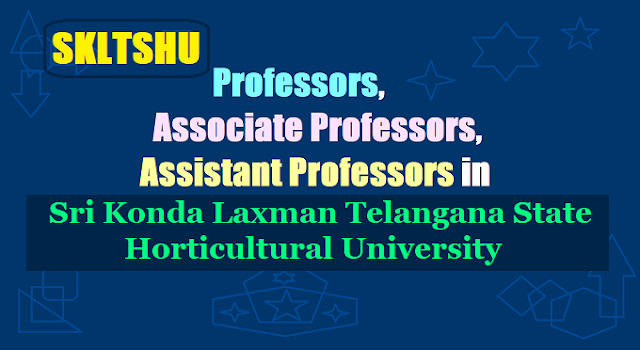 Sri Konda Laxman Telangana State Horticultural University, Rajendranagar, Hyderabad, invites applications from the eligible interested candidates for selection and appointment in the cadre of Assistant Professors, Associate Professors and Professors in various departments / disciplines in the faculty of Horticulture and allied subjects. i. A Four years Bachelor’s degree in Horticulture/ Agriculture /Agricultural Engineering from any State Agricultural University/Central Agricultural University/Central University with Horticulture / Agriculture Faculty/ICAR Deemed University. ii. A Master’s degree in the subject (discipline) concerned with atleast 55% marks or its equivalent grade from any State Horticultural University / Agricultural University/Central Agricultural University/ Central University with Agriculture Faculty/ICAR Deemed University. A. (i) An eminent scholar with Ph.D. qualification(s) in the concerned discipline / department and published work of high quality, actively engaged in research with evidence of published work with a minimum of 10 publications as Research papers and books. (ii) A minimum of ten years of teaching / research / extension experience in university/college, and/or experience in research at the University/National level institutions, including experience of guiding candidates for research at doctoral level. (iv) A minimum score as stipulated in the Academic Performance Indicator (API) based Performance Based Appraisal System (PBAS), set out in this Regulation in Annexure. B. An outstanding professional, with established reputation in the relevant field, who has made significant contributions to the knowledge in the concerned discipline / department, to be substantiated by credentials. i. Good academic record with a Ph.D. Degree in the concerned disciplines / departments. iii. A minimum of eight years of experience of teaching / research / extension in an academic/research position equivalent to that of Assistant Professor in a University, College or Accredited Research Institution excluding the period of Ph.D. (course work period within the University and total period outside the University). Research with evidence of published work and a minimum of 5 publications as Research papers and books. v. A minimum score as stipulated in the Academic Performance Indicator (API) based Performance Based Appraisal System (PBAS), set out in this Regulation in Anenxure. vi. The evaluation will be based on API & PBAS for 75 marks and 25 marks for oral examination for Associate Professor & Professor Cadres. ASSISTANT PROFESSOR: Application in the prescribed form are invited for the under mentioned posts together with Registration Fee of Rs.1500/- (Rupees fifteen hundred only) for OC & BC and of Rs.750/- (Rupees Seven hundred and Fifty only) for SC, ST & PH in favour of "COMPTROLLER, SRI KONDA LAXMAN TELANGANA STATE HORTICULTURAL UNIVERSITY" payable at RAJENDRANAGAR, HYDERABAD and enclose the DD along with the application. Fee once paid will be not be refunded under any circumstances. ASSOCIATE PROFESSOR/PROFESSOR: Application in the prescribed form are invited for the under mentioned posts together with Registration Fee of Rs.2000/- (Rupees two thousand only) for OC & BC and of Rs.1000/- (Rupees one thousand only) for SC, ST & PH in favour of "COMPTROLLER, SRI KONDA LAXMAN TELANGANA STATE HORTICULTURAL UNIVERSITY" payable at RAJENDRANAGAR, HYDERABAD and enclose the DD along with the application. Fee once paid will be not be refunded under any circumstances. 1. The candidates are advised to download the application form University website www.skltshu.ac.in and read carefully all the instructions before filling the application. 2. The last for submission of application is 03-10-2017 by 04.00 PM. 3. Candidates desirous of applying for more than one post should submit separate application for each post along with requisite application fee for each post. 4. Candidates are required to ensure that they fulfill the eligibility criteria in all respects before applying. 5. Applicant should enclose the following copies along with the application. 6. Candidates are required to pay application registration fee in the form of Demand Draft for Rs.1500/- (Rupees fifteen hundred only) for OC & BC and of Rs.750/- (Rupees Seven hundred and Fifty only) for SC, ST & PH in favour of "COMPTROLLER, SRI KONDA LAXMAN TELANGANA STATE HORTICULTURAL UNIVERSITY" payable at RAJENDRANAGAR, HYDERABAD and enclose the DD at the time of applying. Fee once paid will be not be refunded under any circumstances. 7. The UGC 2010/ICAR regulations are applicable wherever necessary. 8. The Government of Telangana rules shall be applicable in the matter of ROR. 9. Candidates belonging to BC/SC/ST category should submit their attested copy of caste certificate issued by the Competent Authority. 10. The Applicants claiming reservation under physically disabled quota should furnish the attested Medical Certificate from the authority, competent to issue the said certificate. 11. No TA and DA will be paid to the candidates appearing for interview when called. They will have to attend the interview at their own cost. 12. Selected candidates will have to join the post within 60 days from the date of issue of appointment orders or date of dispatch of the orders whichever is later failing which their appointment shall be automatically cancelled. 13. Selected candidates shall be governed by SKLTSHU Service Regulations and such other conditions as may be prescribed by the University from time to time. They are liable to be posted or transferred to any equivalent posts of Teaching, Research and Extension wings under the University spread over the whole state of Telangana. 14. The University reserves the right not to fill any of the post advertised. The decision of the University shall be final. 15. The University reserves the right to withdraw any advertised post(s) partial or full advertisement at any time without assigning any reason. 16. Candidates must ensure before applying that they are eligible according to the criteria stipulated in the advertisement. If candidate is found ineligible at any stage of recruitment process, he/she will be disqualified and his/her candidature will be cancelled. Suppressing of facts or submitting false information by the candidate may lead to disqualification of candidature for the post during the selection process or at any time of his/her service. 17. Candidates are advised to visit the University website (www.skltshu.ac.in) for updates. 18. The decision of the Vice Chancellor, SKLTSHU, Hyderabad in all matters relating to eligibility, acceptance or rejection of applications, mode of selection, conduct of examination/interview will be final and binding on the candidates and no enquiry or correspondence will be entertained in this connection from any individual or his/her agent. 19. Canvasing in any form and/or bringing in any influence will be treated as a disqualification for the post. 20. The competent authority reserves the right to extend the closing date for receiving applications. 21. The applicants at the time of interview should bring all the original certificates/documents. 22. The Candidate should submit the application form together with copies of certificates/documents in triplicate for Assistant Professor cadre, so as to reach the "Registrar, Sri Konda Laxman Telangana State Horticultural University, Rajendranagar, Hyderabad-500 030" on or before 03-10-2017 by 4.00 PM. 23. The in-service candidates of SAU's/CU's/DU's, Central Institutes of ICAR and State Agriculture & Horticulture Departments should send their application form through proper channel to the "Registrar, Sri Konda Laxman Telangana State Horticultural University, Rajendranagar, Hyderabad" on or before 03-10-2017 by 4.00 PM. However, they may produce the “No Objection Certificate” from their organization at the time of interview. Candidates should possess the prescribed qualifications as on the date of this notification. Filled in application should reach the undersigned on or before 03-10-2017 by 04.00 PM. For all other details visit University website: www.skltshu.ac.in. The University is not responsible for late receipt of application due to postal delay.